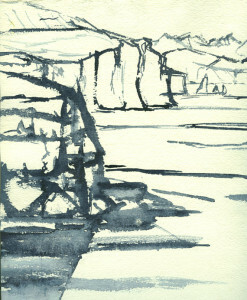 This painted drawing, even though it looks fairly carefully made, was created while sitting on the edge of a cliff during an arduous two-day walk. The mysterious Maidens, strange rock women, seem to move around in the background while the nearer cliffs loom. I think the composition should translate into a really dramatic large painting, in colour. Another painting made on the same walk – not sure if it was the same day, but I remember the sun was shining as I sat by this burn that plummeted down to the sea. 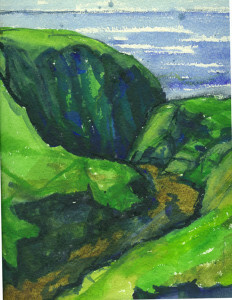 A small painted sketch of hills nearer home. 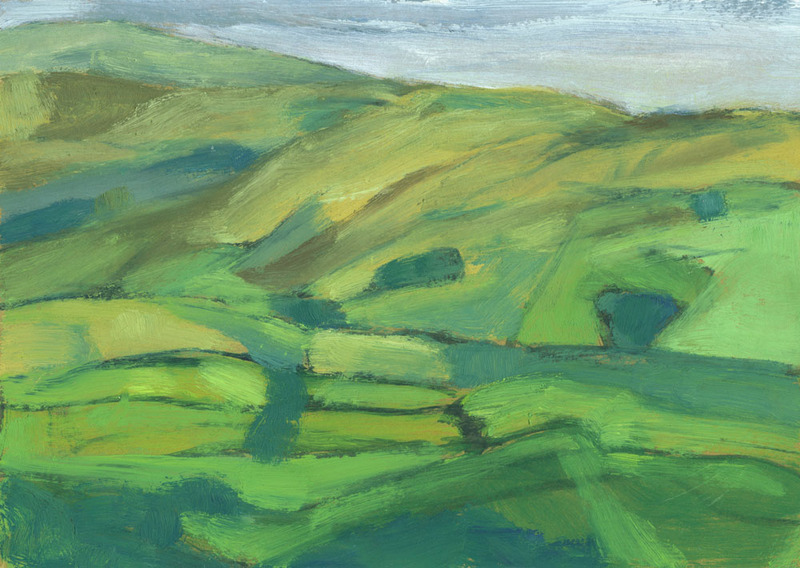 Something in the pattern created by the field boundaries and the shapes of the hills is intriguing, and at least part of that pattern needs to become a larger picture, I think. This entry was posted in paintings and tagged cliff walk, cliffs, Dibidal, field boundaries, MacLeod's Maidens, painted sketches, paintings, plein air, Sedbergh view, sketches, Skye, studies on January 7, 2012 by fellpainter.